This 18 minute TEDx Talk by Michael Shellenberger is one of the best pro-nuclear power, anti-solar power, anti-wind power arguments that I have ever heard. He cites a huge number of statistics to show that compared to solar power and wind power, nuclear power is far better for the environment, far cleaner, far better for animals, far safer for humans, far more reliable, far cheaper, and has a far smaller environmental footprint. March 14, 2019. Tags: Climate change, Environmentalism, Global warming, Michael Shellenberger, Nuclear power, Solar power, Ted Talk, TEDx Talk, Why renewables can’t save the planet, Wind power. Environmentalism. 2 comments. Kat Timpf recently gave a great explanation of Alexandria Ocasio-Cortez’s Green New Deal. Here’s the video and a transcript. I just think AOC has completely lost her marbles. I think she’s living in Bananaland. Earlier this week, she called herself “the boss” for coming up with the Green New Deal. How are you “the boss” for coming up with a plan that doesn’t work? Are you sure that the Green New Deal is not like what you’re putting in your pipe and smoking every day? I can come up with plenty of plans that don’t work. How about we fly around on unicorns instead of airplanes? How about instead of gasoline we use fairy dust we get from Tinker Bell? How about we get Harry Potter to come over and wizard away all the emissions from the cow farts she’s so concerned about? See, I just came up with three plans that don’t work. Does that make me “the triple boss”? Does she want us to just completely do away with all modern technology? I don’t want to live like Laura Ingalls Wilder. I don’t want to do my laundry in a basin. I don’t want to only eat lettuce and carrots like some kind of [censored] bunny. I don’t want to relive the Donner Party in the modern day because I had to take a horse and buggy to see my grandparents instead of a plane. I don’t want to eat people, and I don’t want people to eat me. AOC, do you want people to eat you? March 7, 2019. 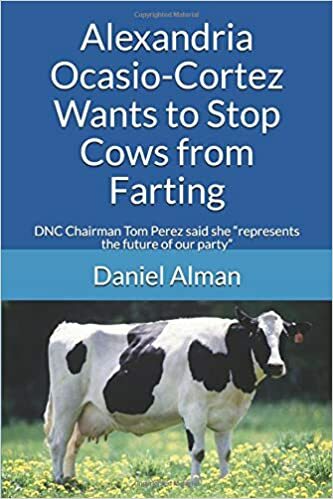 Tags: Alexandria Ocasio-Cortez, Bananaland, Climate change, Donner Party, Environmentalism, fairy dust, Global warming, Green New Deal, Kat Timpf, Laura Ingalls Wilder, Politics, unicorns. Alexandria Ocasio-Cortez, Environmentalism. Leave a comment. Patrick Moore is a co-founder of Greenpeace. I think Moore’s comment would have been more effective without those first three words. I do agree with everything else that he said. March 4, 2019. Tags: Alexandria Ocasio-Cortez, Climate change, Environmentalism, Global warming, Green New Deal, Patrick Moore, Politics. Alexandria Ocasio-Cortez, Environmentalism. 3 comments. Global warming hypocrisy at its finest! Every single time they have one of these international global warming conferences, there’s a always a huge number of attendees who arrive on private jets. The most recent example of this hypocrisy just happened at the Global Climate Action Summit in San Francisco, California. The San Francisco International Airport said that corporate jet traffic was 30% higher than normal, and that much of this was due to attendees of the environmental conference. Why not fly commercial air travel instead? Or better yet, why not stay home and attend via Skype? September 23, 2018. Tags: Climate change, Environmentalism, Global Climate Action Summit, Global warming, Politics. Environmentalism. Leave a comment. Satellite measurements show that between 1982 to 2016, the total global land area covered by trees increased by a net amount equal to the combined area of Texas and Alaska. This does not surprise me, because I already knew that among countries with an annual per capita GDP of least $4,600, deforestation has ceased to exist. A team of researchers from the University of Maryland, the State University of New York and NASA’s Goddard Space Flight Center has found that new global tree growth over the past 35 years has more than offset global tree cover losses. In their paper published in the journal Nature, the group describes using satellite data to track forest growth and loss over the past 35 years and what they found by doing so. To track global tree cover changes, the researchers studied data from advanced very high-resolution radiometers aboard a series of 16 weather satellites covering the years 1982 to 2016. By comparing daily readings, the researchers were able to see small changes occurring regularly over a relatively long period of time—which added up to large changes. Over the entire span, the researchers found that new tree cover had offset tree cover loss by approximately 2.24 million square kilometers — which they note is approximately the size of Texas and Alaska combined. Land change is a cause and consequence of global environmental change. Changes in land use and land cover considerably alter the Earth’s energy balance and biogeochemical cycles, which contributes to climate change and—in turn—affects land surface properties and the provision of ecosystem services. However, quantification of global land change is lacking. Here we analyse 35 years’ worth of satellite data and provide a comprehensive record of global land-change dynamics during the period 1982–2016. We show that—contrary to the prevailing view that forest area has declined globally—tree cover has increased by 2.24 million km2 (+7.1% relative to the 1982 level). This overall net gain is the result of a net loss in the tropics being outweighed by a net gain in the extratropics. Global bare ground cover has decreased by 1.16 million km2 (−3.1%), most notably in agricultural regions in Asia. Of all land changes, 60% are associated with direct human activities and 40% with indirect drivers such as climate change. Land-use change exhibits regional dominance, including tropical deforestation and agricultural expansion, temperate reforestation or afforestation, cropland intensification and urbanization. Consistently across all climate domains, montane systems have gained tree cover and many arid and semi-arid ecosystems have lost vegetation cover. The mapped land changes and the driver attributions reflect a human-dominated Earth system. The dataset we developed may be used to improve the modelling of land-use changes, biogeochemical cycles and vegetation–climate interactions to advance our understanding of global environmental change. August 11, 2018. Tags: deforestation, DOI: 10.1038/s41586-018-0411-9, Environmental Kuznets curve, Environmentalism, forest, Global land change from 1982 to 2016, Kuznets curve, Nature, satellite data, Study shows global forest loss over past 35 years has been more than offset by new forest growth, trees. Environmentalism. Leave a comment. The woman in this video talks about what it’s like for her and her family to live off grid with solar panels and batteries. She and her family are real environmentalist who practice what they preach. She says there are some inconveniences, but that they have manged to get used to them. She also says their daily electric usage fell from 60 kwh to between 4 and 6, not counting their limited use of air conditioning, which brings their daily usage up to 10. August 10, 2018. Tags: Environmentalism, Green energy, Solar power, Technology. Environmentalism, Technology. Leave a comment. Shame on the mainstream media for ignoring government tampering with global temperature data! Real Climate Science just posted this article, which claims that the NOAA has been tampering with its global temperature data. The article links to government data to support its claims that the government has been tampering with the data. Unfortunately, the mainstream media is not reporting on this government manipulation of global temperature data. Shame on them! March 21, 2018. Tags: Climate change, Environmentalism, Global warming, Media bias, NOAA, Politics. Environmentalism, Media bias. 3 comments.